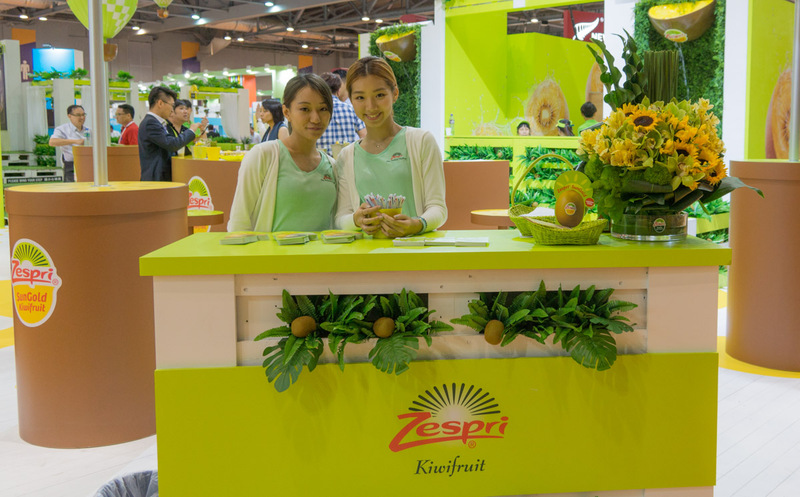 The Zespri booth at Asia Fruit Logistica in 2015. Currently, Zespri sources counter-seasonal kiwifruit for the Chinese market from Italy. "Think big, start small, scale quickly," says Zespri external relations manager Nick Kirton in explaining his company's philosophy about bringing locally sourced red and green Zespri brand kiwifruit to market in China. "Think big" describes a long-term goal of Zespri, the world's largest kiwifruit supplier, to use Chinese-grown fruit to supply the Chinese market during the three to four months of the year when New Zealand kiwifruit is not available. As Zespri celebrated the launch of the 2018/19 kiwifruit season late last month, the company announced that China, "is now rivalling Japan as Zespri’s top market." But China has a reputation as challenging environment for foreign companies to set up local fruit production. And it presents unique challenges to a business model such as Zespri's, in which the company does not own any orchards or postharvest facilities, but instead relies on strong partnerships with local farmers and industry. "Start small" is evident in the fact that Zespri started this latest round of exploration into marketing domestic kiwifruit to Chinese consumers way back in 2015 when it signed an MOU with the government of Shaanxi province to set up trial production sites there along with a kiwifruit research and exchange center. But Kirton will still not predict in what year domestic kiwifruit bearing the Zespri brand may actually come to market in China. And "scale quickly" means that Zespri hopes that through a meticulous process of researching production sites and varieties, training local partners and building relationships with local industry and governments, when the time comes, all the pieces will be in place to fill off-season demand in China and grow supply at the same speed as demand. Kirton confirmed in an interview with Produce Report that Zespri plans to use Chinese green and red varieties to source and market domestically in China. "We won't work with Hayward here in China," says Kirton. "We'll work with a couple different varieties, and we're still working through that at the moment…There are some very good tasting Chinese varieties. What you'll find typically is they're not consistently good. And what the consumer wants is consistency. You want every one to be a good one. Having the Zespri brand on the fruit gives that promise." Zespri does not plan to trial or provide local growers in China its proprietary green Hayward, sweet green or yellow varieties. Growing closer to the consumer, "will be useful for some kiwifruit varieties, such as the red varieties," says Kirton, "because the red varieties typically don't handle the supply chain as well as the green or gold." As part of the effort to identify promising local varieties and help local growing partners maintain quality and grow yield over time, Zespri has established what Kirton calls " innovation trial orchards" in Shaanxi and Sichuan provinces, two of China's two kiwifruit producing areas. These orchards will not be used to supply fruit to the market. For potential commercial sourcing, Zespri has set up "trial production hubs" in Shaanxi and Henan provinces. Last year, Zespri conduced small-scale supply chain trials, using fruit sourced from Sichuan and Shaanxi and following it all the way from orchard to retailer. In that trial Kirton says Zespri found, "no insurmountable barriers" to bringing fruit to market that meets the company's quality standards. This year, Zespri will use fruit from the Shaanxi and Henan trial production hubs to run more extensive trials focused more on what Kirton calls the, "commercial realities around what we're doing." This will include more consumer feedback as well as retail sales: "when we sell it, we'll be getting consumers' opinions about what they think," says Kirton. Ultimately, Zespri is looking to build up production hubs in Shaanxi, Henan, and potentially other provinces down the line, with multiple growers in the same areas as packing facilities, so that can get fruit to market quickly and efficiently. And while Zespri will not own or lease the land or the postharvest facilities, "right through the growing season, we're there alongside them," says Kirton "Showing them new techniques, showing them how to do things the Zespri way, monitoring what inputs go into the orchard so it's compliant with our systems." Currently Zespri's off-season kiwifruit supply for China comes from Italy. "I think ideally the strategy in the future would be, in the off-season, China supplies China," says Kirton. But following the, "think big, start small, scale quickly," he says Zespri doesn't want to rush anything. "This is about doing it right, rather than how fast we can do it."